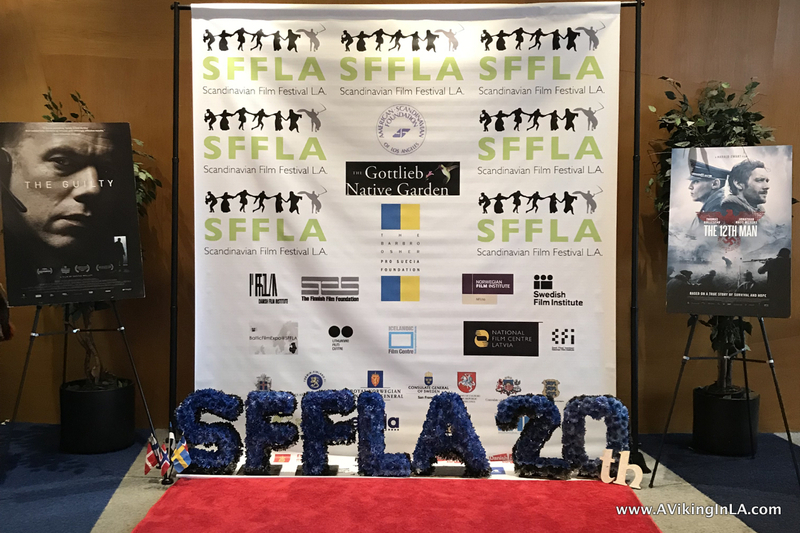 Long time subscribers to my blog will know that the Scandinavian Film Festival LA is one of my favorite annual Scandinavian events in the Los Angeles area. This year the festival opened the first weekend in January and it continues this coming weekend, January 19 and 20, in Beverly Hills. The first weekend did not disappoint, and the second looks to be promising as well. 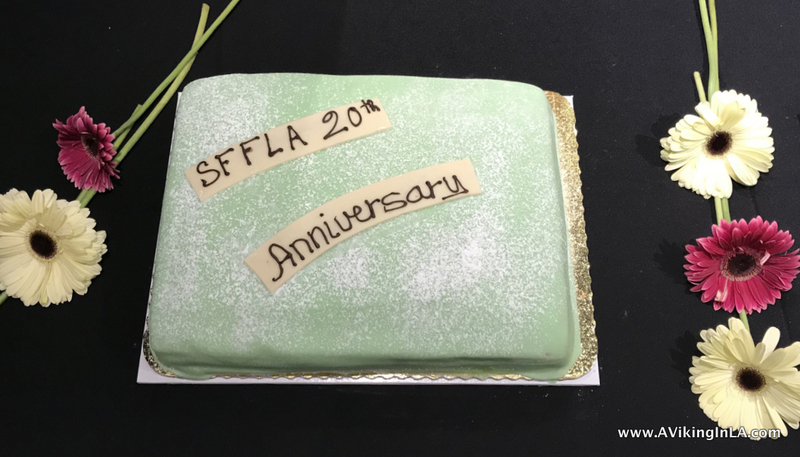 This year the festival celebrates its 20th anniversary. A full house of Nordic film enthusiasts was at the Opening Gala on Saturday evening of the first weekend to celebrate this milestone. 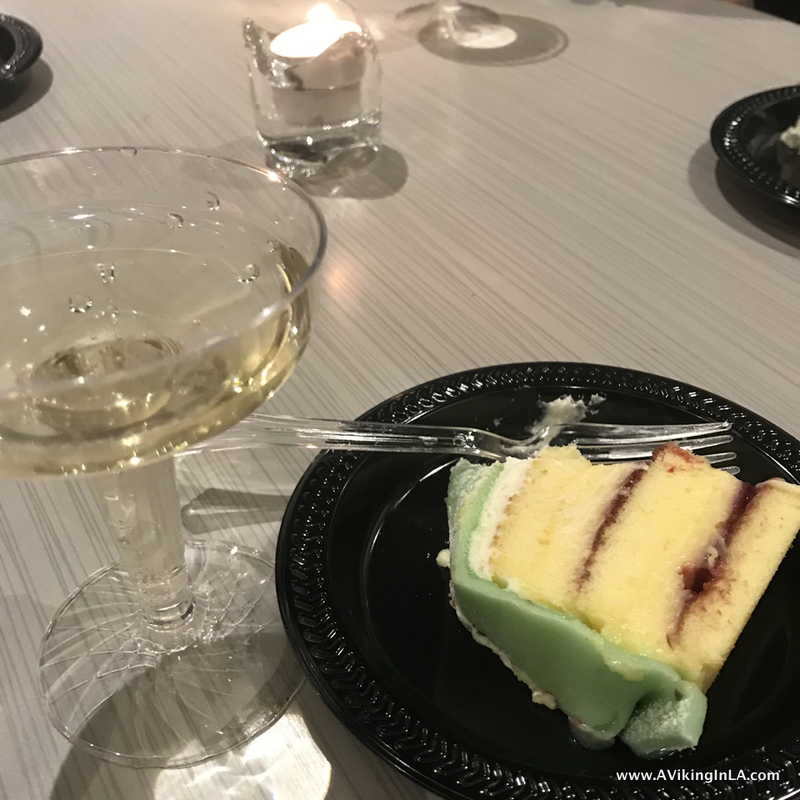 Along with a buffet of favorite Scandinavian foods, the festivities included a champagne toast and delicious Princess Cake from Copenhagen Pastry at the end of the evening. Compared to other film festivals, this is a small one. But it’s very welcoming and friendly. Many festival goers come for multiple screenings. They hang out in the lobby between films. They chat and enjoy food from the Nordic Café, the best part of which is the pastries from none other than Copenhagen Pastry. Last year I volunteered for the first time and I did so again this year because it was such a fun and rewarding experience. The festival is basically a family-run operation with Jim Koenig as head of the festival and his sister Flo Niermann in charge of ticket sales and volunteers. And they are so grateful for their volunteers. During the first weekend I saw four films: Sweden’s Border, Denmark’s The Guilty, Iceland’s Woman at War, and Norway’s The 12th Man. I would have seen a fifth, Norway’s What Would People Say, if I hadn’t already seen it (highly recommend it, read more at What Will People Say by Iram Haq: An #OwnVoices Immigrant Story from Norway). I also very much enjoyed Denmark’s thriller/drama The Guilty directed by Gustav Möller. It’s about a police officer who’s been demoted to work as an emergency dispatcher. He expects nothing more than a boring evening answering calls from drunks and druggies. However, he gets a phone call from a woman who’s been kidnapped and so begins a desperate search from his desk for the woman. It is extremely suspenseful with interesting twists. At the same time, viewers wonder and learn more about the officer’s demotion. The lead actor, Jakob Cedergren, is perfect for the role which is good because the whole movie is focused on him. 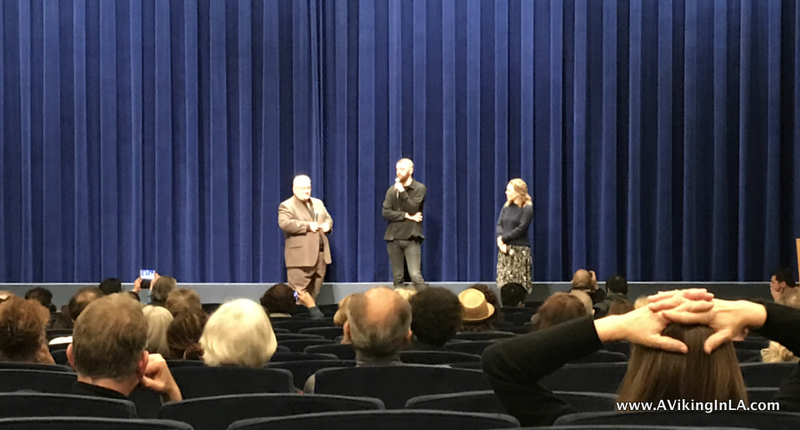 As a festival bonus, director/writer Gustav Möller and producer Lina Flint were at the screening and answered questions afterward. It’s always interesting to get a glimpse behind the scenes of a movie, and their story as friends from film school in Denmark was a great one. Find out if there’s a showtime near you or watch it at home. Interestingly, there will be an American remake of The Guilty with Jake Gyllenhaal in the lead so see the original before that comes out. Sweden’s Border directed by Alli Abbas was not at all what I was expecting. I did not do my research properly and went in blindly. I was expecting something realistic about border issues, which was not at all the case. I later saw the movie described as a “dark romantic fantasy fable.” Had I known this, I may have enjoyed it more since my expectations would have been different. It’s about Tina, a customs officer who uses her extraordinary sense of smell to identify people who are smuggling. She also has an extreme connection to the natural world. One day when traveler Vore walks past, Tina senses something suspicious about him but nothing is found. However, an attraction develops between them, and when Tina begins to develop a relationship with Vore, she discovers his true identity and also learns the truth about herself. I wrapped up the first weekend with Norway’s The 12th Man directed by Harald Zwart. 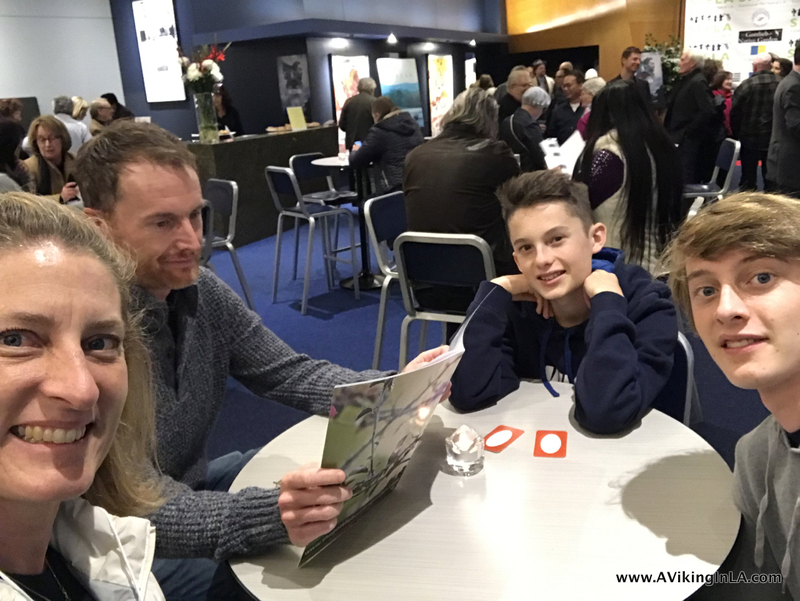 I brought my family along to this film since I had previously seen it at a special screening at The Museum of Tolerance and thought it was an amazing World War II story of survival, will to live, and kindness to others despite tremendous risk. The movie is based on the true story of Norwegian resistance fighter Jan Baalsrud who was the only one of 12 Norwegian resistance fighters on a mission from Shetland to sabotage Nazi activity in Northern Norway to escape when they were discovered by Nazis. It chronicles his journey towards neutral Sweden which would not have been possible without the kindness and help of locals who risked their own lives. It turns out my family was not as enthralled with the movie as I was. They thought there was too much brutality (Germans against captured Norwegians), too much gruesomeness (German torture of captured Norwegians and Jan’s physical condition throughout his journey), and too much repetition of plot elements. I thought it was important for my kids to see the local Norwegian resistance in action as both my grandfathers had been a part of it before one escaped to Sweden and the other was sent to a camp in Germany. Also, the Norwegian landscape was beautiful and I loved the unexpected glimpse into Sami culture. This coming weekend I will see Utøya – July 22 directed by Erik Poppe, a film about a teenage girl who struggles to survive and to find her younger sister during the July 2011 terrorist mass murder at a political summer camp on the Norwegian island of Utøya. I expect it to be a difficult film to watch considering the subject matter. I have read Åsne Seierstad’s non-fiction book One of Us: The Story of a Massacre in Norway — And Its Aftermath so at least I won’t be totally surprised by the scale of terror and horror. I have not yet decided on which other films to see during the upcoming weekend. It will depend on when I’m there as a volunteer. Estonia’s Take It or Leave It, Sweden’s The Cake General, Denmark’s Becoming Astrid, and Finland’s One Last Deal all look interesting (see schedule). I’d be curious to hear your thoughts about the festival if you’ve been or plan to go. This entry was posted in Film & TV, Los Angeles & Environs and tagged Beverly Hills, Denmark, Erik Poppe, film, Harald Zwart, Iceland, Norway, SFFLA, Sweden, Utøya, WWII by Patricia Zanuck. Bookmark the permalink.